Singer. Songwriter. Producer. Underrated guitar virtuoso. All of those descriptors – and many more - fit Butch Walker. But “musical chameleon” is perhaps the one that’s most accurate. With a professional recording career that began with him playing guitar in a hair metal band, then migrated through a solo career in the arena rock, alt-rock, and singer-songwriter genres before arriving at its current indie/Americana home, the only thing constant about Walker’s music has been change. With his solo career now spanning six releases and 11 years, Walker has quite a catalog from which to draw his set list on his current tour for the recently-released Peachtree Battle. 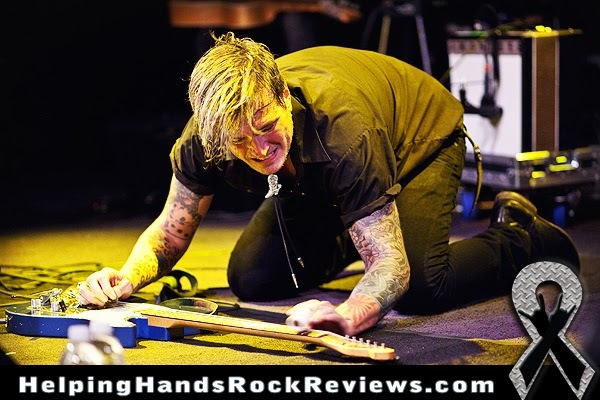 Helping Hands Rock Reviews set out to Mr. Smalls in Pittsburgh, Pennsylvania on November 1, 2013 to see what gems Walker would pull from his vast musical portfolio for his eager fans. These opening tunes that Walker played solo really showcased all that is unique and memorable about his singer-songwriter style: mind-blowingly strong falsetto singing, Joe Cocker-style facial expressions, and a playful push-pull of the song tempos that conveys every last drop of his passion to the audience. One could picture him singing alone in a stadium full of quiet listeners as they hang on his every word and allow themselves to be hypnotized by the image-rich story lines of his compositions. Anytime an artist has a radio hit, as Walker did with “Freak of the Week” in the Marvelous 3, that artist can’t escape a show without playing said hit. So, Walker began playing the guitar intro to “Freak” while talking about having sung the song so many times it makes him throw up in his mouth. Just then, in a move clearly unplanned by Walker but embraced nonetheless, Kevin Michaels, singer of the Pittsburgh-based Poison tribute band Say Ahh, jumped on stage to take the mic and sing the song for Walker. Judging by the crowd reaction, they didn’t mind the guest appearance either. At that point, it was time to really amp up the energy of the show. Walker’s three band mates joined him for the remainder of the 90+-minute set, which included music from every Walker release from 2006’s The Rise And Fall of Butch Walker and the Let’s Go Out Tonites forward. That left Left of Self-Centered - which many loyal Walker fans consider the best Butch collection - as the only album not represented in the set. Highlights of the full band’s set included “The 3 Kids in Brooklyn,” during which Walker played slide guitar on the floor; “Synthesizers,” which featured a segue to and from the ‘80’s Dexy’s Midnight Runners’ classic, “Come On Eileen;” and the evening-ending “Hot Girls in a Good Mood,” which saw Walker venture out into the crowd, have everyone crouch down around him, and then later rise just as a massive amount of multi-colored confetti was unexpectedly launched from the stage above them. Ending the set with a song about a good mood was appropriate because, judging by the smiles seen and conversations heard after the lights went up, a good mood was exactly what all the Butch faithful were in after the show. With a large, diverse, and top-quality array of original songs, the chameleon had a color to appease all of his devotees on this night in the steel city.